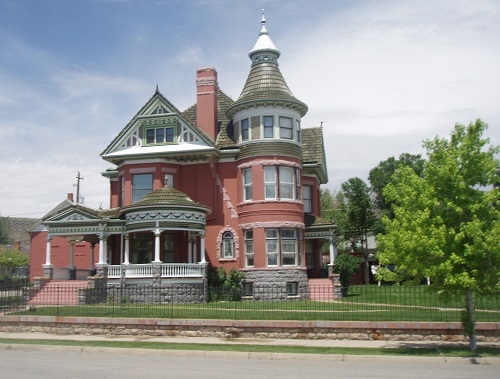 The George Ferris Mansion, a historic home in Rawlins, Wyoming, United States, now operates as a bed and breakfast. George Ferris was one of the sons of Samuel and Sally Ferris. Born in Michigan in 1840, he died in Carbon County, Wyoming, in 1900 when thrown from a carriage. He is a fifth great grandson of Jeffrey Ferris through Joseph and brother to Alvirus (Alvis) Ferris. 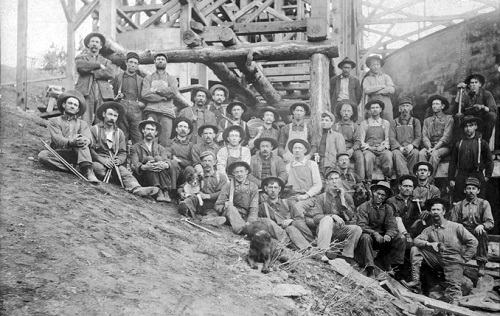 George made his fortune in Wyoming, investing in a copper mine that would become known as the Ferris-Haggarty mine. His home, built between 1899 and 1903, is now a landmark in Rawlins, Wyoming, and is operated as a bed and breakfast. The price of copper is one of the more variable commodity prices, even today. At the time the mine operated, the labor intensive efforts could easily make copper mining unprofitable. Research conducted in the late 1900s found a substantial pocket of gold deep in the mine which, even today, cannot be exploited effectively. The Ferris-Haggerty mine is a 100 year old abandoned underground copper mine on private land within the boundary of the Medicine Bow National Forrest near Encampment, Wyoming at an elevation of 9,500 feet. The site is situated in the remote upper reaches of Haggerty Creek, about four miles north of Wyoming Highway 70… At the turn of the nineteenth century it was one of the largest Copper mines in the region, producing an estimated 24 million pounds of Copper from 1898 to 1908. The mine used state of the art mining equipment, including a 16-mile aerial tramway (touted as the largest in the world at the time) for transporting metal ore to a smelter in Encampment. The copper ore was initially extracted from the underground workings through two vertical shafts driven from the surface and later from a main haulage level, called the “Osceola Tunnel”, whereby the ore was transported to the surface using a compressed air locomotive and rail cars. The ore was then transported over the Continental Divide to the smelter in Encampment via the aerial tramway. By 1904 the mining operations were at their apex, employing 200 men and producing over $1,400,000 worth of copper. Mining operations ceased in 1908 presumably as a result of smelter fire, financial problems, mismanagement and declining copper prices. Foreclosure proceedings began in 1913 and salvage operations followed shortly. The Ferris-Haggerty Mine Site was added to the National Register of Historic Places on July 2, 1973. The main environmental cleanup challenge presented by the mine is a substandard water discharge from the ore transporting/drainage tunnel. This water contains 4 mg/L of copper and discharges into Haggerty Creek at a rate ranging from 50 gallons per minute (gpm) to 500 gpm, depending upon the time of the year. This amount of copper has rendered the stream directly below the mine virtually lifeless.